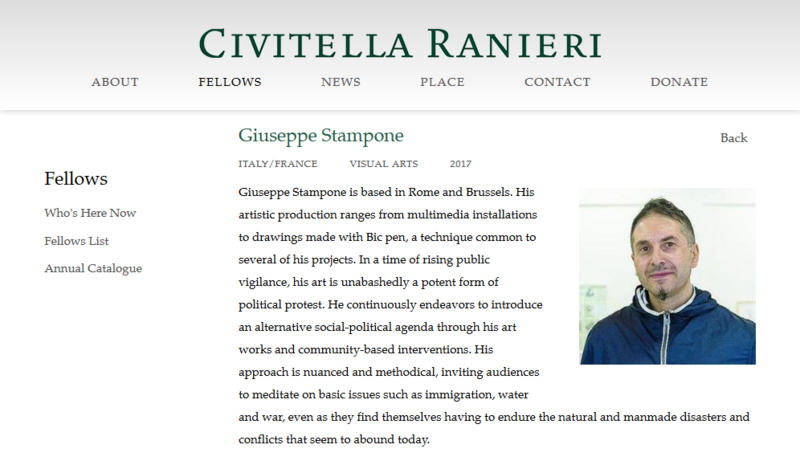 Giuseppe Stampone is based in Rome and Brussels. His artistic production ranges from multimedia installations to drawings made with Bic pen, a technique common to several of his projects. In a time of rising public vigilance, his art is unabashedly a potent form of political protest. He continuously endeavors to introduce an alternative social-political agenda through his art works and community-based interventions. His approach is nuanced and methodical, inviting audiences to meditate on basic issues such as immigration, water and war, even as they find themselves having to endure the natural and manmade disasters and conflicts that seem to abound today.